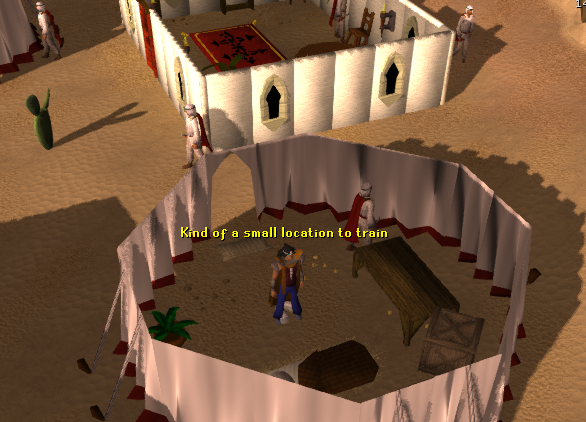 Located in the western Kharidian Desert, the Bandit Camp is a great place to train your combat on hostile enemies. If you find yourself stranded without supplies, there is a shop for all of your Bandit needs. This town plays a big part in the Desert Treasure Quest. The most convenient way to get there is traveling by Magic Carpet from the Shanty Pass and walking south from the Bedabin Camp. The Magic Carpet ride costs 200gp, or 100gp if you have the Ring of Charos (a) from the Garden of Tranquility Quest. The price will also drop by half if you've completed the Rouge Trader Mini-game. This is not recommended since you will take damage from the desert, but if you don't have money for the Magic Carpet yet you have money for waterskins and desert robes, it won't be too bad. Just follow the path on the map above leading southwest from the Shanty Pass. There are level 21 and level 27 Desert Wolves that may be a danger to lower-leveled players. 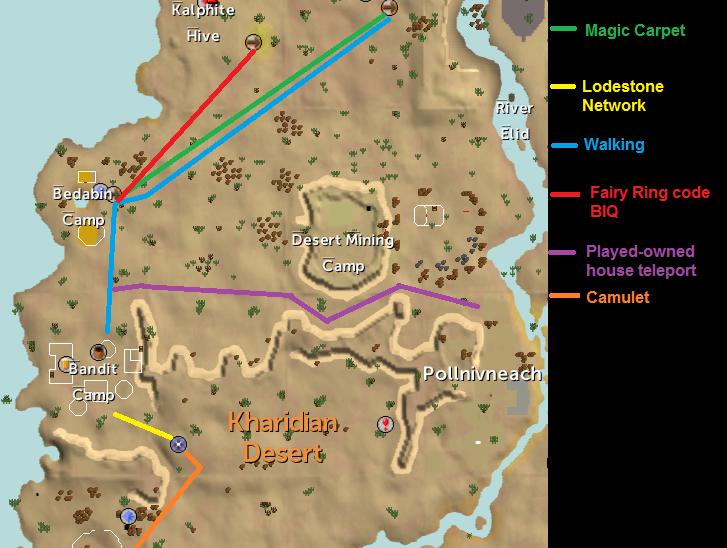 If you have unlocked the Bandit Camp location on the Lodestone network, simply teleport there and walk a little northwest to the camp. If you have access to Fairy Rings by starting the A Fairy Tale Part II: Cure a Queen Quest, you can use fairy ring code BIQ to be teleported near the Kalphite Lair. From there, just walk south. If you have your Played-Owned House set in Pollnivneach, you can simply teleport to your house, exit the portal, and walk west from there. The spell requires level 40 Magic, and 1 Law, Earth, and Air rune. If you have completed the Enakhra's Lament Quest, you can use your Camulet to teleport near the Quarry, then walk north. 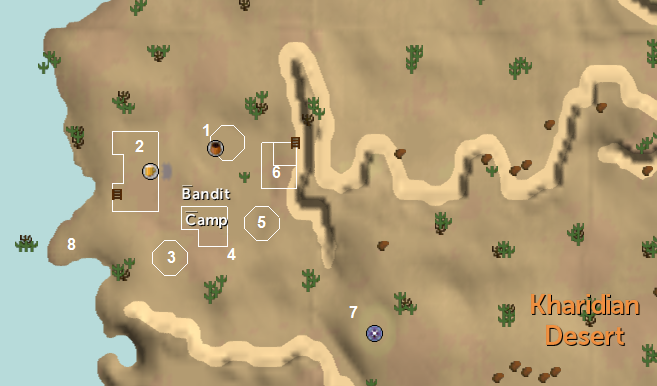 Bandit Camp Teleport scrolls are obtained from Clue Scrolls of any level. They teleport you directly to the camp and can be obtained either from a clue scroll, or from buying it on the Grand Exchange. The shop is a tent located in the northern part of the camp. It is operated by the Bandit Shopkeeper and it is called "Bandit Bargains." The bar is filled with level 74 Bandits, and of course a Bartender. 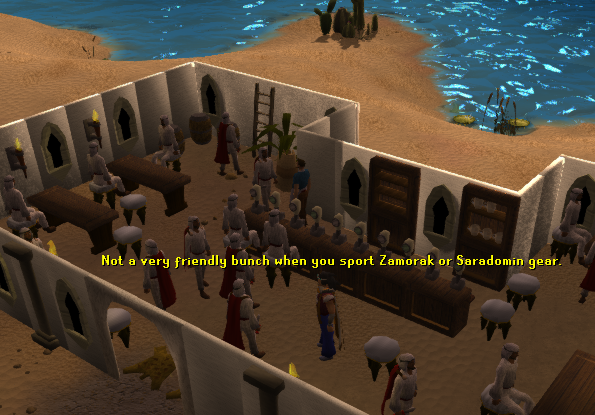 The Bandits are useful for training on, as they all become aggressive if you are wearing a piece of Zamorak or Saradomin armor. Just set your options to "Auto Retaliate" and stay at your keyboard at all times. This is the most popular place to train but usually the most crowded. If you talk to any of them, you will get a nasty message, as they don't really want outsiders in their camp. 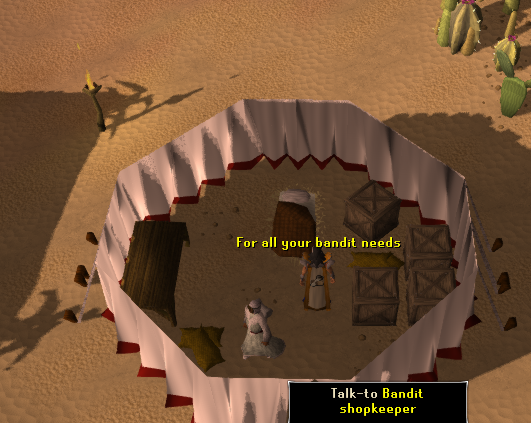 You will be able to buy a Bandit's Brew for 650gp from the Bartender. 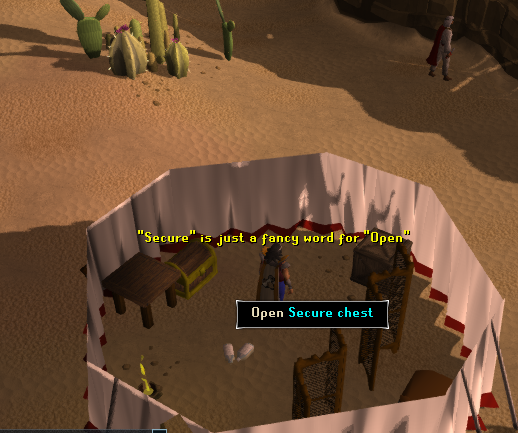 This is the only place you can get it and it temporarily increases your Thieving level by 1. 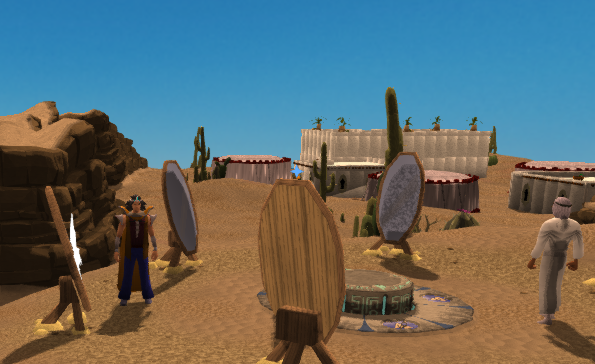 If you complete the Desert Treasure Quest, they will be more friendly towards you. In the southwestern part of the city, you will find a small tent with a treasure chest. 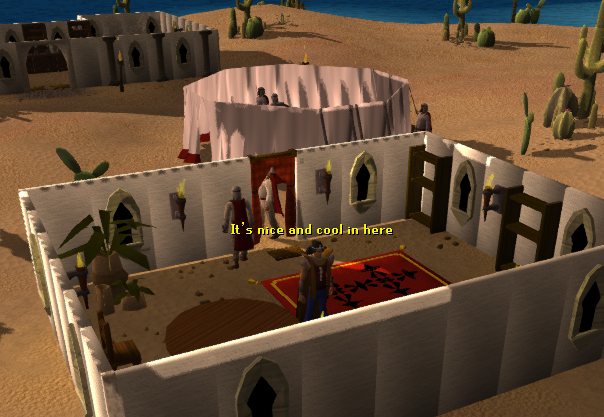 Rasolo's Golden Cross is inside during the Desert Treasure Quest. You will need level 53 Thieving to open it. There is a chance that you will fail and trigger a poisonous trap, so bring an anti-poison potion. This chest may take several lockpicks to open as you need to break three locks. Boosting your level will not help you open the chest. 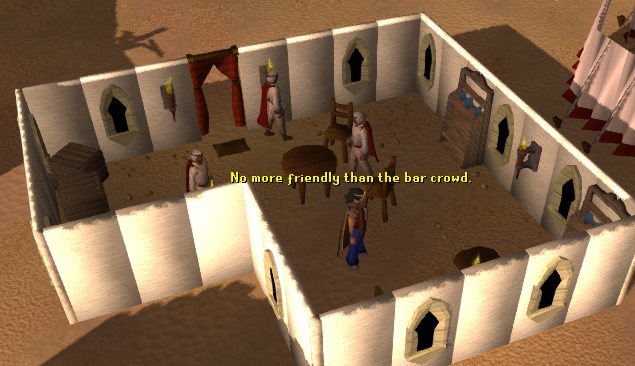 Much like the bar, the Bandit Training House is ideal for training combat. You will need good armor, food, and an item dedicated to Saradomin or Zamorak. Guthan's Barrow armor is recommended since it can help you heal without the need for food. The only downside is that it degrades and repair is costly if you don't have a high Smithing level or an armor stand in your Player-Owned House. Also, keep the doors closed so that Bandits can't escape. This is a small tent for training on Bandits. This is only used by players if the other areas are too crowded, as there are only two, occasionally three, bandits inside this tent. Use the method explained earlier and keep the doors closed. It is the most eastern tent in the camp. This is a much larger posh building where you can train on Bandits. Much like the tent, it only has two and sometimes three Bandits. It is the most north eastern building in the town. These mirrors are located out of the city limits to the south east. They are used to help you find the diamonds in the Desert Treasure Quest. The NPC, Eblis, will sell you an Ancient Staff for 80,000 gp. You can only buy one from him. This peninsula is located to the west of the city. It is used during a coordinate Treasure Trail. You will have to defeat a level 108 Saradomin Wizard to claim your reward.